Hey Divas. DT EK here showing off a birthday card I made for a young man. I find that making cards for preteen boys to be hands down the most difficult of the types of card I make. However, I find the CDD stamp set It's All About Zoo, is kind of the perfect for young men. After all zoo animals are always a hit with my son and his friends. So I pulled out some black card stock to stamp on. However, I quickly realized a major problem. I'm in the middle of a move, and only packed a black copic friendly ink, and a waterproof black ink...so how was I going to stamp out on black card stock using only black ink. Well, you can actually see black ink on black card stock, so I just went forward with my stamping. (Notice the moving box as my impromptu desk.) I wanted to build a scene, so I pulled out some flowers and grasses from the CDD Build a Scene 2 scenery stamp set. 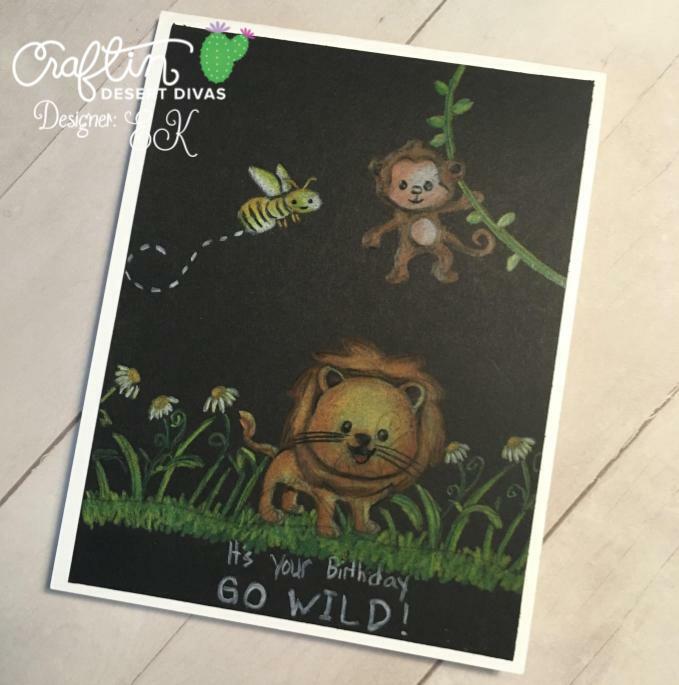 I masked off the lion, stamped out the grasses, and added the monkey. In a last minute decision, I decided to add a fluttering bee from the Build a Scene 2 stamp set. I pulled out my colored pencils and colored in the image. I love how colored pencils look on black card stock...just make sure you have a scrap near by because colors can look different than you would expect. When I added the sentiment from the stamp set, I had a bit of a problem, still not having ink that would show up, so I stamped out the birthday greeting and then went over it with a pale grey pencil. My die cutting machine is packed up, so I had to simply trim up the card stock and added it to an A2 card frame.